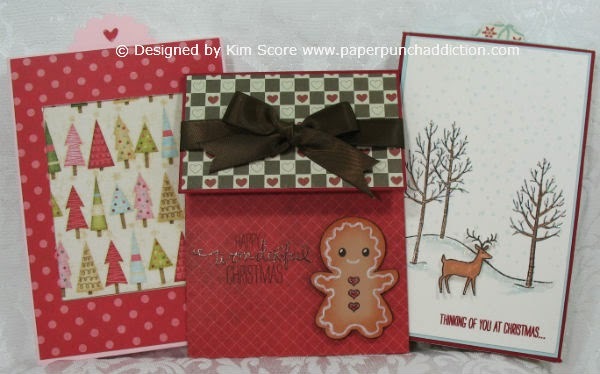 Paper Punch Addiction: Peachy Keen Challenge - Anything Goes! I love a challenge that lets me do anything I want! I wanted to get at least one more halloween project in this month. 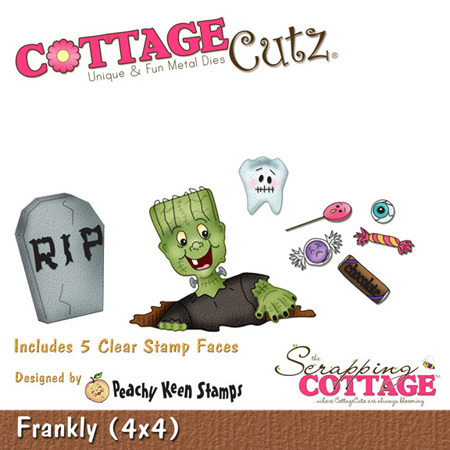 My card features this cute Cottage Cutz die by Peachy Keen called Frankly. I love the fact that this set has a complimentary stamp set with a selection of fun greetings. The stamp set is PK-634 Frankly. I created this fun Hershey Nugget box with a coordinating card. I wrote out the instructions below for anyone that is interested. Be sure to head over to the challenge site to see some more fun Anything Goes projects by the design team HERE. I'm giving away a prize! 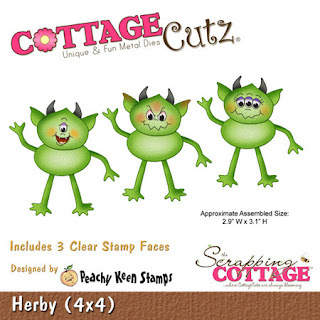 Leave a comment to enter my random drawing for a free Cottage Cutz die called Herby. This little guy was my design contribution to Peachy Keen. I hope you love him as much as I do! Cut a 5-1/4" x 4" piece of basic black card stock. Score at 5/8" on all 4 sides. Apply adhesive to tabs and secure in place to form box bottom. Wrap 6 Hershey Nugget candies with designer papers 1" x 3" and place in box. Cut a 5-5/16" x 4-1/16" piece of window sheet (acetate). Score at 5/8" on all 4 sides and assemble top like bottom. Tie ribbon around box to keep lid in place. You've outdone yourself! He is too cute and not too scary for the little ones. Your Frankly card is adorable. Herby is sure cute too. Herby is super cute too. Very cute project. Very child friendly. Thanks for sharing. These stamps are sooo cute! Love your card ... aDORable!!!! 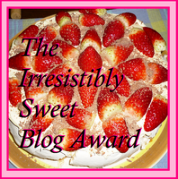 I enjoy seeing the many crafty items on your blog. There are such wonderful talented crafters out there. The monster stamp is so cute. Would love to win it. Thanks so much for the box idea. i have been looking for something I can make and make several of them and I think this will do it. Love the card too, so cute. Thanks for the chance to win. thanks for the instruction, I was looking for a box to fit this type of candy. Omg he is sooooo cut, great card I just love it. Frankly, he's so cute! Herby is adorable as well! Oh my goodness Herby is the cutest die!! I just love him. I am going to make your nugget box, it is so nice, thank you so much for the instructions!! 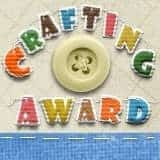 I love this CUTE set and the name goes good too..Here's hoping I win but it is such a cute card thanks for all you do to inspire all of us with your crafting ideas!! 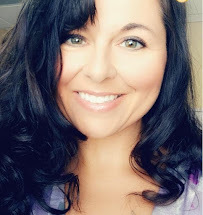 Your project as always is fabulous Kim! Thank you for sharing and for your super cute giveaway! I just love this set it is too cute and your card is awesome. Thanks for all you do and share with us. Just checked out your projects. Love them! So cute...Frankly he really made me smile! Herby is so cute. Thanks for sharing with us. Love Herby. Thanks for sharing with us. You always do a marvelous job! Thanks for sharing. Outstanding job, as usual! Thanks for sharing. Love the Frankly card and box, but sure miss you in my in box daily. He is super adorable, love this! I always think I am just going to take a peek at your site and then find my self still looking after an hour or two!! Love Herby and so would my stamping club. Keep up the good work. I absolutely LOVE Herby! Feel free to send him to me and I will see to it that he is loved regularly. Your site is one of my favorites. You are so very creative! Thanks for all your sharing. It really is appreciated. Frankie is too stinkie cute. YOur projects are awesome! I am always amazed ant what dies can do Kim and you showcase them to their maximum potential. Love it!! So cool for Halloween. I love Frankly! He is really cute! Your card is cute. Your Frankie card is too cute! Love your projects with both Frankly and Herby - would so love to win - nowhere to find these dies in my area and you make them all look like so much fun!! Thank you for sharing all your beautiful projects! luv the frankie nugget holder thank you for directions HOPE I WIN! I love the nugget tin. I never thought to make one for Halloween! I love all your projects. Your site is one of my favorites! Neat treat box. Thank you so much for sharing the instructions! Love your Frankie card! Very cute!! 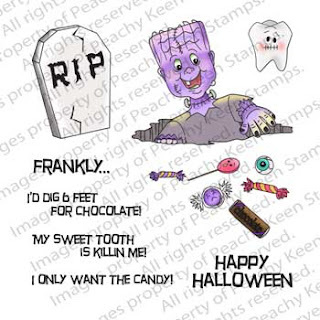 I especially love the tooth and the candy, but the whole set is adorable and spooky. I love your work. Very inspirational and everyday I look to see what you have done. It's like christmas every day of the year. Frankly is perfect !!!!! Herby is one handsome fellow. I have made him out of punches, but a die would be much easier. Love your blog. I always look at your first. I am going to make Frankly and the card. They are awesome. Kim, You come up with the best ideas! I think I will have to make the candy box for my kids in Sunday School class. He is just adorable. Thank you so much. You are the BEST! Ohmygoodness! I think I love him more!!! ;) Herby is adorable!!!!! And you did a great job on your Frankly card, too! I love your Frankly card, and the Herby is really cute, I believe my 1 1/2 yr old grandson would love him too, he's not really scary.